A bird's eye view of MediaShift's second annual Journalism School Hackathon. Photo by Johanna Huckeba of the Walter Cronkite School of Journalism and Mass Communication. 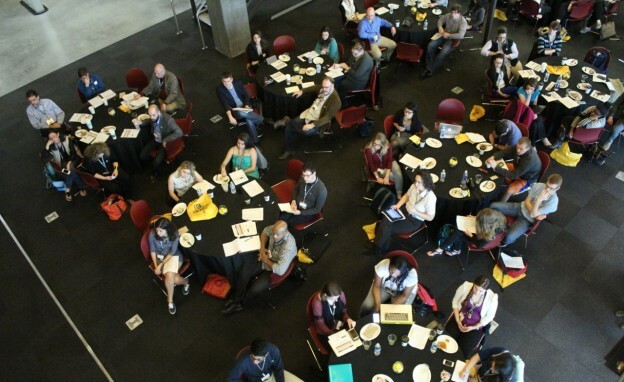 PBS MediaShift produced its second annual Journalism School Hackathon in conjunction with the Walter Cronkite School of Journalism and Mass Communication at Arizona State University in Phoenix at the end of February. Top students, faculty and professionals gathered with a specific aim for this year: to create sustainable media projects that reach underserved populations. They were tasked with creating media projects in one of three threads: data, gaming or audience engagement. "Top students, faculty and professionals gathered with a specific aim for this year: to create sustainable media projects that reach underserved populations." We’ve rounded up a collection of photos, video, coverage and a Storify to take you back to the hackathon and spotlight some of the ideas that came out. Did we miss anything? Please add it in the comments, and we’ll update the post. PBS Mediashift 2nd Annual Hackathon Team Pitches from Cronkite School on Vimeo. PBS Mediashift 2nd Annual Hackathon Winners Announcement from Cronkite School on Vimeo.